5 star reviews for YTA just keep coming in! We absolutely love reading your reviews following the courses, please keep sending them in to us. Below we have 2 lovely reviews from recent students after completing a few courses with us. 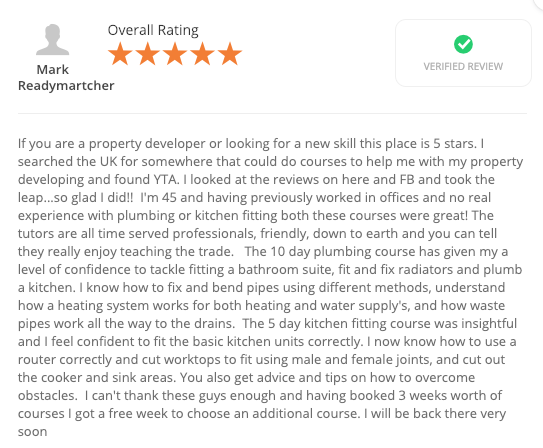 Mark Readymartcher – completed 10 day plumbing course and 5 day kitchen fitting course = 5 star review! 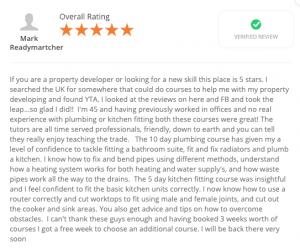 Anonymous – 1 day plumbing course = 5 star review! Did the 1 day plumbing taster as I’d never done plumbing before and wanted to know how to fix leaks and tackle basic problems around the house without calling and paying for a plumber. The guys at YTA were very friendly and got us working with materials straight away. Lyndon was a great and patient instructor throughout and made sure to tailor the exercises to ensure they were relevant to what I wanted and that I got the most out of my day with them. Would definitely recommend for anyone wanting to improve their DIY skills. At YTA we are very proud of the hundreds of consistent excellent reviews we receive every month from all our courses. If you are looking for a reputable construction training centre to deliver a variety of trades from plumbing courses to plastering courses then you will not be disappointed with YTA. Why not pop in for a brew and we can show you how we do things and have a chat about a suitable course for yourself!